Dear LA, can we have these bike lanes too?? Swapping parking and the bike lane might seem small but it makes a world of difference. It reduces the chances of getting “doored” when a driver opens a parked car door without looking at the bike lane, it reduces the chance that people will block the bike lane with their trash cans forcing bikes into lanes of traffic which annoys the drivers, it reduces the chance of a driver suddenly pulling into a bike lane and double parking, the list goes on and on… Dear Los Angeles, can we have these please? Please?? You’d have to turn more major streets one-way to accommodate it, which isn’t such a bad idea. The biggest problem in LA is that our large arteries might be too far apart for this to work (the pressure on the side streets would be enormous). If the Bike Lane and Car Parking are switched as in the picture above, doesn’t that actually increase the chances of getting “doored” by a driver? As the lanes are currently set up, a biker may get doored by someone on the passenger side, but I can’t see how they would get doored by a driver. While this solution does seem to afford a greater degree of safety to bikers, I’ll play Devil’s Advocate. If the Lane is switched, what’s to stop drivers from double-parking in the Bike Lane, or residents putting their garbage cans in the Bike Lane? In the current set-up, at least the biker can get around these obstacles by riding into traffic. What are the bikers going to do if there is a wall of parked cars to their right? I saw an article in Le Monde about plans in Paris to put counter-traffic bike lanes in that city (it’s been done elsewhere in Nantes, Bordeaux, Lille & Strasbourg where the speed limit is 30km for all vehicles. The Paris city council has set a goal of 770km of bike paths in 2010 compared with 440 now. There are critics who say this will increase the risk of accidents with concern for the use of the lanes by scooters or taken over by street peoples’ living spaces. unexpected results of the change. A city wide review and accident anaylis will be done in 2011 to see the effects of the change. Sorry, can’t copy the photos but they are not so funny. New York City has Eagle Rock’s Occidental College alum, and bicycle messiah, Janette Sadik-Khan as their transportation commissioner. It is largely her leadership that has facilitated New York City’s demand for better bicycle infrastructure. We really are on opposite coasts. But Sadik-Khan also said at Occidental that it was about having the political will, i.e., Mayor Bloomberg behind her. That’s why I try to write Mayor Villaraigosa & my city council rep — or if Mowery says LADOT is hidebound by state law, Governor Schwarzenegger and my state reps about these things. 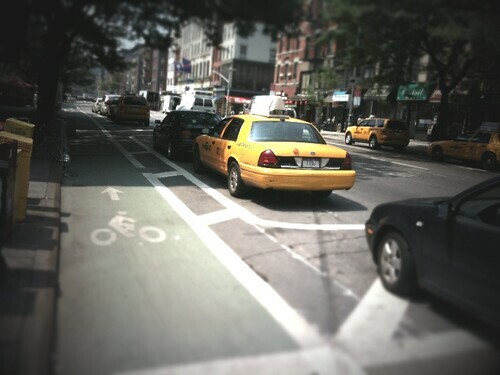 Pingback: TYPO-GRAPHICAL » Blog Archive » Dear LA, can we have these bike lanes too? main roads 31, local roads 149, cycle paths 166. All crashes: main roads 47, local roads 149, cycle paths 319. @Jimmy – The photo I took in NYC is of a one way street, but it’s not required in anyway. The same thing works in 2-way streets just on the other side of the street. @Tim – LA doesn’t have the one way streets that NYC does, so it would be on the opposite side of the street and on the passenger side. All cars have drivers, much less have passengers. Also people currently put their trashcans in the bike lane because it’s out past parked cars and easy for the trash trucks to pick them up. Putting trash cans in the bike lane of a set up like the one above would be pointless as the trucks couldn’t get to them. @Walt – yeah, we all already know Mowery is an idiot. Hopefully someone in the city govt will get that message someday. here in melbourne we have all manner of bike lanes, including some like these – which as a daily cyclist i hate. my colloquial evidence is the following – these ones bring a much increased danger of cars exiting driveways out to the road will virtually never stop for the cycle lane, but pull out to the line of cars to see if the road is clear to enter….but a car at 90 degrees to the parked cars will be a lot wider than the space given for the parked cars and as such blocks the entire cycleway…not giving a bike travelling at any reasonable speed much space to stop in time, depending on where they are when the cars pull out to the kerb, and the wall of parked cars gives no chance of turning to avoid leaving only the footpath as an exit route. i always stick to the road on these streets as at least i know the drivers will probably stop beforethey enter it to look for oncoming traffic. @Sean Bonner: So, if residents can’t put their trash cans in the Bike Lane, where are they going to put them? In the auto traffic lanes???? Sean, hope you rent/borrow a bike while in NYC. It is an awesome place to ride, and a great way to see the city. Dagnabbit. San Francisco has beaten us at this too. What wussbags my native NYers have become. You haven’t lived until you have pedaled furiously down 5th Avenue just ahead of a speeding bus and a bevy of taxis, hoping that you’ll get a magic procession of green lights and arrive downtown breathless and in one piece. I totally agree. I won’t ask but demand this…..and since the Mayor got hit while one bike I hope things do change. I myself got hit by a car on my bike in 2008. It was a painful scary thing. It comes down to respect…..which Angelinos don’t have for bikers. Well some don’t….mostly those that drive Hummers.